After scheming and murdering its way onto our screen back in 2011, Game of Thrones is about to see its end with the fast approaching eighth and final season. It has changed modern television, and it has cemented its place alongside the most significant pieces of television of all time. Hey everyone, I’m Andy, and today I’m here to countdown the greatest ever Game of Thrones moments out of the seven seasons that have already aired (I’ll update this once season eight finishes). From betrayals to some of the best action set pieces of all time, these are the moments that remind me why millions of people (including myself) love Game of Thrones! As always, I have some honourable mentions to hand out before I go into the Top 15. Although these didn’t make the cut, all of these are amazing moments, and I adore them all. The Shadow Assassin (Season 2, Episode 5): Poor Renly. All he wanted was to rule the seven kingdoms with Loras, but instead, his brother created a shadow monster and was murdered in his own personal quarters. Littlefinger Gets Played (Season 7, Episode 7): Although the whole Winterfell plot was pretty weak throughout season seven, the payoff was one of the most satisfying moments of the series. Bran quoting Littlefinger from when he betrayed Ned back in season one was the icing on the cake. The Walk of Shame (Season 5, Episode 10): Yes, we may all despise Cersei, but her walk of shame in the season five finale was one of the most depressing moments of the series. Her cries towards the end prove why Lena Headey is the best actor in Game of Thrones. For the Watch (Season 5, Episode 10): The season five finale was really depressing. Stannis was killed along with his army, Cersei had her walk of shame, and Jon Snow was murdered by his own brothers. As soon as he realises what is about to happen, the tears start flowing. Chaos is a Ladder (Season 3, Episode 6): I could put any scene where Varys and Littlefinger interact with each other, but this iconic monologue from Littlefinger shows us just how the Game of Thrones is played, and we finally see what Littlefinger wants. A Crown for a King (Season 1, Episode 6): Remember when Viserys Targaryen was the most hateable character of the series? Those were simpler times. Everyone was still alive, and this was the first major death of the series. Khal Drogo pouring the molten gold over his head was brutal, yet extremely satisfying. Stannis Does the Unthinkable (Season 5, Episode 9): When people talk about the most depressing moments of the series, Stannis sacrificing his own sweet and innocent daughter always comes up. I’m getting sad just thinking about it. Easily one of the hardest scenes to watch in television history. The Tower of Joy (Season 6, Episode 10): Yes, the excellent fight between Ned and Arthur Dayne was in an earlier episode of the season, but it’s the reveal of Jon Snow’s true mother that stands out. The transition from him as a crying baby in the arms of Lyanna Stark (or was it Ned?) to him sitting at the head of the Winterfell table sends chills down my spine every time. Frey Pie (Season 6, Episode 10): F### Walder Frey and his entire family for what they did to the Starks (I’ll talk more about THAT scene later on). But watching Arya serve Walder a pie made from his sons and proceeding to slit his throat made me cheer with joy! I Want Her to Know it Was Me (Season 7, Episode 3): Olenna Tyrell is easily one of my favourite characters from the series, and her final moments solidified her status as a fan favourite. Watching her tell Jamie that Joffrey’s death was her doing after he gave her a painless poison is one of the most excellent “f### you” moments of all time. Daenerys Sacks Astapor (Season 3, Episode 4): The moment when Daenerys unleashes her new Unsullied army and dragons upon the slavers of Astapor is a scene that no Game of Thrones fan has ever forgotten. The moment you find out that she can speak High Valyrian is chilling. Jaime Loses His Hand (Season 3, Episode 3): Jaime Lannister is one of the greatest characters ever written, and it is this moment early on in season three that sends him on a path of redemption (and a path to become a fan favourite). What a way to end an episode! Kicking off this list is the scene that showed us what kind of series Game of Thrones was going to be. The first ever episode of the series took us into the dark fantasy world of Westeros by introducing us to the houses, relationships and political intrigue the show is based around. The episode may have started off with the introduction of the White Walkers, but it’s the ending that is just as shocking and memorable as it was back in 2011. When Bran Stark decides to climb the walls of Winterfell (even after he promised his mother he would never do it again), he comes across the sounds of two people moaning. When he peeks into a rundown tower, he sees the sexual act being partaken by twins Jaime and Cersei Lannister. Jaime catches him and holds him at the window, as Cersei screams “He saw us!”. Jaime lets go of him as we believe that Bran won’t say anything about it. But then the Kingslayer casually says, “the things I do for love,” and pushes Bran out of the window, resulting in him being paralysed for the remainder of the series. It’s a shocking moment, and it still remains as one of craziest cliffhangers in television history. Game of Thrones is known for some of the greatest on-screen battles of all time, but it wasn’t until the penultimate episode of season two that we got our first proper battle. Yes, there may have been some fights and the beginning/aftermath of particular battles, but it was the Battle of Blackwater Bay that pushed television to its limits. After a season of the Lannisters (well, Tyrion mainly) and Stannis Baratheon planning for a battle, we finally got the conflict we were eagerly anticipating. The whole battle is terrific as we don’t know which side we really want to support, but it’s the beginning that genuinely stands out. We get to see what Wildfire is capable of in the form of a gigantic green explosion, which takes out a large chunk of Stannis’ fleet and the sight of it is enough to let us know that we are about to witness one of the most significant battles in television history. Yes, it may not seem to have the size and scale of Hardhome, Battle of the Bastards and the Battle of the Goldroad, but to see the power Wildfire has and the strategic genius of Tyrion resulted in one of the most memorable hours of the series. I remember back in 2016 when season six was about to start, and many like myself believed the season was going to end with the White Walkers taking down the Wall. Turns out we were wrong as the season ended with Daenerys sailing for Westeros. But just over a year later, the Night King killed and resurrected Viserion (one of the three dragons) and what may be the craziest season finale cliffhanger of the series was born. After almost 90 minutes of setting up the final season, we are taken to the wall where the White Walker army turns up to Eastwatch (the Night’s Watch base at the end of the eastern part of the Wall), and we are left wondering what is about to happen. Then suddenly the Night King flies in on the back of an undead Viserion, and we are left terrified at the speed and power he has. The entire undead army stands and watches as Viserion burns down the Wall with its blue fire breath, and then that huge section of the wall falls down. This allows the army of the dead to march on through to Westeros for what will be a crazy battle. For 67 episodes we have seen the struggle it takes for people to get around/over/through the Wall, and now the White Walkers have an extremely powerful weapon, the rest of Westeros is vulnerable. The White Walkers are finally past the Wall, and all that can stop them are our heroes in what is already known as the Battle of Winterfell. For thirty-two episodes, we were all subjected to the tormenting, evilness and cowardly nature of Joffrey Baratheon. Actor Jack Gleeson portrayed this character we all loved to hate in one of the best performances of the series. Even after three seasons of him getting progressively eviler, it was his wedding that was his standout moment. Joffrey has gone down as one of the greatest TV villains of all time, and to finally watch him die in an incredibly horrible way was one of the most satisfying moments in television history. Yes, he is only meant to be a boy, but damn it was satisfying to see this horrible king die brutally. But one bad thing did come out of it, and that was that Tyrion was framed for the murder (but this does lead to many moments that may make this list). When talking about characters every Game of Thrones fan loves, Tyrion is usually the one who always pops up. Tyrion has had a tough life as a midget who has been ridiculed all of his life by everyone around him, including his family (well, not Jaime). But the one person who has genuinely mocked him all of his life and blames him for the death of his mother is of course Tywin. I’ll admit, I love Charles Dance and his performance as Tywin Lannister, so I was a little sad that he got killed off. But to finally see Tyrion stand up to his father after forty episodes resulted in one of the most satisfying moments of the series. It was a perfect ending to Tyrion’s King’s Landing arc, and it’s hard not to sympathise with the little man during this scene. 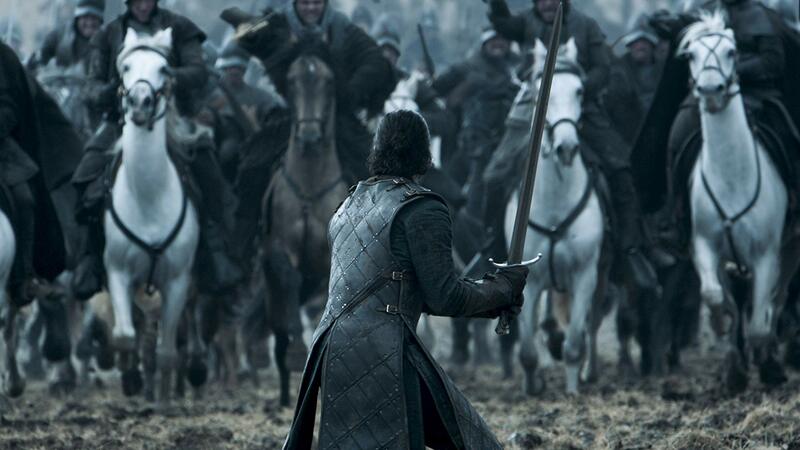 Of course, I had to include what is arguably the best human battle sequence on Game of Thrones yet (let’s just hope the Battle of Winterfell can live up to the massive hype that’s building around it)! The battle that we had been anticipating for almost an entire season ended up being worth the wait and oh my how intense and brutal it is. I could’ve filled up this list with moments just from this battle, but I decided to put the entire sequence on here as it is one of the greatest filmed battle sequences in film and television history. At least two times throughout the Battle of the Bastards, you start to think that this could be the end for Jon Snow (the moment when he is struggling to get back up after being trampled is brutal). Even with the excellent choreography and acting, it’s the fact that we’ve been waiting for four years to see the Stark flags cover Winterfell again. We finally got to see it again, and I can easily say it is one of the most satisfying moments in the series. Also, Ramsay’s death is just as satisfying, and it’s a perfect way to end a masterful sequence! Since when did the showrunners think that the death of a beloved character halfway through a season would be a good idea? As sad and shocking as Hodor’s death is, it’s brilliant, and it made me realise that season six was going to be one of the best yet! George R. R. Martin has said this revelation is the second of his three “holy s###” moments of the series, and when first watching it, I cried like I was watching The Notebook for the first time. It’s one of the most heartbreaking scenes in the series and to see this fan favourite character’s purpose come to fruition is both memorable and soul-crushing. As soon as we see a young Hodor finally transform the words “hold the door” into “Hodor” and the screen goes black, all we can do is cry. Remember when Daenerys had one of the best character arcs in television history? Way back in the first ever episode of the series, Daenerys was a shy, tormented and scared girl who was basically forced to marry Khal Drogo just for her brother. Then after falling in love with the Khal (and vice versa), killing her brother and having to put her beloved Drogo out of his misery after messing around with magic, we got this beautiful scene! One thing I love about Game of Thrones is how every season ends perfectly, and season one is no exception. After a season of characters saying that there haven’t been dragons in hundreds of years and that the world will never see them again, we are treated to this epic birth. Watching a naked Daenerys rise from the ashes with three baby dragons sends chills down my spine every time and this (along with a moment that occurred in the prior episode) helped define Game of Thrones. It changed what the show could be capable of, and it signified the beginning of a new Daenerys. Everyone can remember where they were and who they were with when someone talks about the fight between the Mountain and the Viper of Dorne. This was the second trial by combat in the series, and it’s easily the best fight scene between two people so far. But since you’re reading this, sadly you know that it’s the outcome that really makes this fight so damn memorable. Oberyn Martell was a new fan favourite as he was a breath of fresh air the show didn’t realise it needed. Actor Pedro Pascal was perfect in this role and his charisma shined right on through into all of our hearts. Then his teeth were punched out, his eyes were gouged and his head popped like a pimple. I’m quite sure that this is one of the most shocking deaths in television history and many are still trying to get over it. RIP Oberyn Martell. Is this the greatest opening scene in television history? I think the season six finale opening is definitely up there, if not in that top spot. The opening for what is easily the best season finale of the show is crazy, intense and it’s one hell of a checkmate from Cersei Lannister. A lot happened in this breathtaking sequence, with Cersei proving herself as one of the best players in the Game of Thrones. She managed to get all of her enemies (well, most of them) in one place and she used the Mad King’s cache of Wildfire to get rid of them forever. Then there is Margery, with Natalie Dormer giving her best performance yet as the young queen. Her eyes manage to show so many different emotions during this scene, and she’s brilliant. Also, there’s the unforgettable ‘Light of the Seven’ from composer Ramin Djawadi, which perfectly suits this sequence! The slow and long buildup of the piece, which eventually leads to a sort of remix of the main theme, which is used to show the chaos emerging from everyone’s realisation. Then once the crescendo hits and the wildfire ignites, all we can do is look on in shock. Remember when Jaime Lannister was one of the most hated characters on Game of Thrones. Ahhh, those were the simple days when everyone was pretty much alive and well. Then he got captured by Robb Stark, spent months in imprisonment, got released by Catelyn Stark to be returned to King’s Landing with the help of Brienne, got captured again but by some Bolton soldiers, and got his sword hand chopped off. Once his right hand was taken from him, you couldn’t help but sympathise for him. But everyone’s opinion on Jaime changed dramatically after this scene. As we watch Jaime tell the truth about why he broke his oath and killed the Mad King by stabbing him through the back, we come to realise he’s one of the biggest heroes in the show. Nikolaj Coster-Waldau is incredible in this scene as he delivers the lengthy monologue with so much emotion and it’s hard to see how he didn’t win an Emmy for this scene alone (seriously though, he’s one of, if not the best actor in the show and he still hasn’t got an Emmy. Grrrr). There’s just something so compelling about a man who has been called Kingslayer for so many years, who finally gets to tell someone (in this case it’s Brienne in a bath) the truth behind an act that has forever tainted him since. If you don’t somehow consider Jaime as one of the best and most complex characters in Game of Thrones by the end of this scene, are you even human? Many like myself, consider season five to be the weakest out of the seven so far. For the first seven episodes, I was kind of worried about where the showrunners were taking us. We were fast approaching no-book territory, and it seemed as though the show wasn’t going to be the same. Then episode eight happened, and by the old gods and the new, it was phenomenal! We knew about the oncoming threat of the White Walkers ever since first seeing them in the opening scene of the pilot. Yes, we got to see some action from them in previous seasons, but it was season five, episode eight that really showed us why the White Walkers are the biggest threat on the show. Some call this the Battle of Hardhome, but it’s not a battle. It’s a massacre. Almost all of the Wildlings are slaughtered and added to the army of the dead within ten minutes. If that’s not a high body count in a short period, I don’t know what is. After a mesmerising sequence of Jon and the surviving Wildlings fighting off the White Walkers while attempting get as many people to the ships, and an even better moment when Jon kills an actual White Walker with his Valyrian steel sword, we are given a better look at the Night King and what he is capable of doing. Once he has a staring competition with an exhausted Jon and raises his arms Gladiator style to add everyone who just died to his army, we are left in a terrified state. The White Walkers are really here, and this was one of the most chilling ways to show us precisely why they should be considered the most significant threat in Game of Thrones. Every fan has suffered through this shocking moment, and it set the stage for the rest of the series. No character is safe, and your favourite could get killed at any moment. Whenever I put people onto Game of Thrones, I tell them to prepare themselves for anything. Usually, it’s this and another moment coming up that make them message me back saying, “they can’t do that!” Yes, they can do that as this is Game of Thrones. This is a show unlike anything else and Joffrey “Baratheon” exclaiming, “bring me his head” is one moment that will stick with you forever. It’s depressing, but damn it’s brilliant! Poor Tyrion. He’s been ridiculed all of his life for being a dwarf, and now he’s on trial for the murder of Joffrey, which he didn’t do. He’s easily one of the best characters in Game of Thrones, and he didn’t deserve all of this punishment. Now, to the actual moment, which of course is the trial. Well, not the whole trial, mainly the final ten minutes of the trial, which includes what is arguably the best acting in the entire series. Once Shae comes out and tells the judges a fabricated story about Tyrion, his mistreatment of her and his “plot” to murder Joffrey to please Sansa, it’s a heartbreaking and emotional performance from Peter Dinklage that takes the spotlight. Watching Tyrion unleash the anger that has been built up within him for his whole life is both satisfying and sad. He basically insults everyone in the throne room and what’s even more emotional is that he wishes he was the monster they think he is. As this goes on, you start to think that there is no other way this could get even better, and then he pulls a trial by combat card out of his pocket and basically says “f### you” to his father. If there has been a better confession scene in movie/television history, please let me know as of right now, this is the greatest courtroom scene to date, and Peter Dinklage gives a powerhouse performance that won him an Emmy there and then! I can already hear your reaction to seeing what my number one pick is. “Ahhhhh, of course it’s this. How could it not be the Red Wedding?” Remember when everyone thought Ned Stark’s death was the craziest twist in Game of Thrones? The Red Wedding heard you and thought, “You know what? I could top that and make you have PTSD anytime you hear the Rains of Castamere or go to a wedding.” How could the craziest and most disturbing moment in television history not be the greatest moment in the series? It messed up everyone who watched it, and it’s still as effective upon your second, third, hell even your ninth re-watch of the episode. People say that Robb Stark could’ve easily avoided the Red Wedding if he knew how to play the Game of Thrones properly and yes that is true, but that’s the brilliance of the characters in Game of Thrones. Robb Stark’s story-line is a Shakespearean tragedy, and all of the decisions he made throughout led to this f###### wedding. He is an excellent example of how the characters in Game of Thrones feel real. They act like real humans, and they have normal emotions. Robb Stark followed his heart, and it led to the death of his wife, unborn child, dire wolf (RIP Grey Wind), and mother, Catelyn. Damn Westeros is a horrible place the more I think about it. What I also love about the Red Wedding, is just how it is executed. It’s television at its finest (well, in a really messed up way), from how the music changes the mood of the wedding, the realisation from the audience that people are about to die, and of course that this was unavoidable. The Starks couldn’t avoid this horrible wedding, and it truly changed Game of Thrones forever. The Red Wedding has already gone down as one of the greatest moments in television, and it will remain as shocking and disturbing as it was in 2013, for many years to come! This is why the Red Wedding is the greatest moment in Game of Thrones! There you have it, my Top 15 Game of Thrones moments done and dusted. I hope you enjoyed reading this and as always, if there is a moment that I left out that you think should’ve made this list, let me know in the comments. Thanks! This was a truly wonderful read!! !